Skill level: beginner to advanced. These sculpted polymer clay flowers are about 1" to 2" in diameter, which makes them ideal for pendants, pins, beads, hair ornaments, and more. 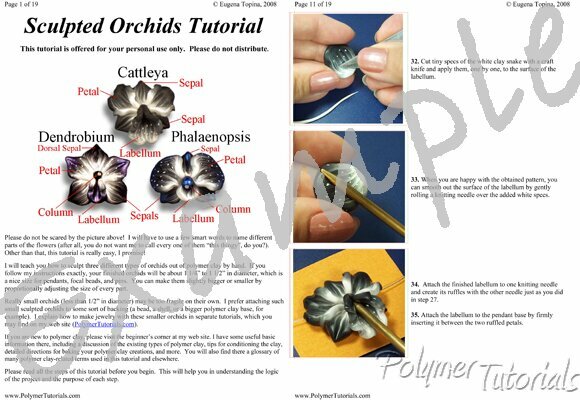 This step-by-step tutorial shows how to sculpt three types of orchids (cattleya, phalaenopsis, and dendrobium) from polymer clay. You will learn how to create beautiful color gradations and life-like petals – all of it using only polymer clay, your own hands, and a couple of simple tools. There are no molds, stamps, or forms of any kind involved in making these orchids. Nearly fifty big full-color pictures showing every step. Place a mouse over the small pictures to see them enlarged. This is the first time I purchased a tutorial, ever. I am so ..